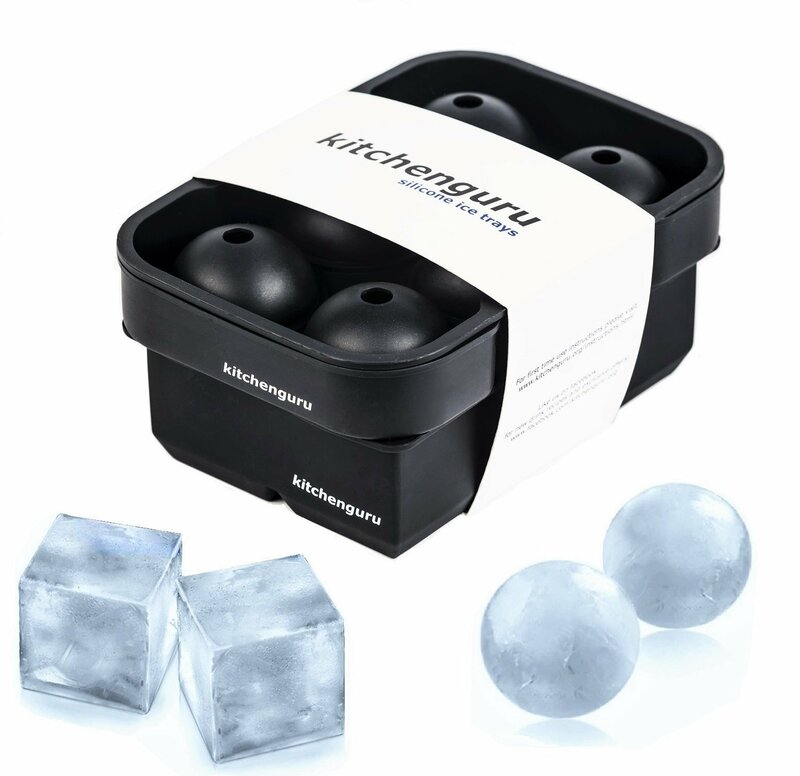 Home › Home and Kitchen › Kitchenguru Silicone Ice Cube Trays & Molds - Large Cubes And Round Ice Ball ..
kitchenguru Silicone Ice Cube Trays & Molds - Large Cubes AND Round Ice Ball Maker Combo Kit - Impress your friends with the coolest of ice cubes that won't water down your drink! COMBO SET OF ROUND ICE BALL MAKER AND SQUARE ICE CUBE TRAYS / MOLDS - You get two silicone ice trays to make both types of ice cubes. HIGH QUALITY EASY CLEAN FLEXIBLE SILICONE - Tired of bending and breaking plastic ice trays? Made with 100% BPA Free FDA approved food grade silicone our trays are super easy to use - they are extremely flexible to make it easy to pop the ice right out without damaging the tray. Making juice popsicles? Our trays are dishwasher safe. USA COMPANY - We are a small American company operating in California. You can trust that we will provide the best and fastest customer service. We have a large facebook community you will be invited to join that we interact with daily providing new drink recipes and tips. 100% MONEY BACK GUARANTEE & LIFETIME WARRANTY - If you are not satisfied with any kitchenguru product you can return within 45 days no questions asked for 100% money back. We will also replace any damaged product for life. Purchase now and press 'ADD TO CART' with confidence. SLOW MELTING LARGE CUBES TO KEEP YOUR DRINK COLD WITHOUT DILUTING - Our square cubes are 2" and our round cubes are 1.75". By using large cubes there is less surface ice to be exposed to your drink than multiple small cubes so it will melt much much slower. You can sip on your drink as long as you like without it watering down. Impress your friends with a touch of class to your drinks Ice cubes made with the kitchenguru silicone ice cube trays add the perfecttouch of class to any drink - let them spark conversation at your next party.Take it a step further and infuse the cubes with fruit or mint! Chill out with a cold drink Relaxing? These cubes are the best to just sit back and chill with... you cansip your drink slow without worrying about it watering down. You deserve it. Features - The kitchenguru square tray mold makes six 2" ice cubes - The kitchenguru round ice ball maker makes six 1.75" diameter ice spheres - Dishwasher and oven safe - 100% BPA free silicone Slow melting - Our large cubes have more surface area and melt much slower than traditional smaller cubes so your drink will stay ice cold much longer without watering down Keeps flavor - Because they melt slower and don't dilute your drink our cubes will maintain the flavor of your drink longer Flexible - Our trays are super flexible. No more broken plastic ice trays or struggling to remove your cubes! Versatile - Put them in a nice beverage, fill them with juice or soda and use them to make ice pops, try making coffee or cream ice cubes to add to your coffee or fill them with cake batter to make cake balls or donut holes We are a U.S. company based in California - you will receive great, fast customer service! Take advantage of our growing facebook community full of people sharing drink tips and recipes. 100% Money Back Guarantee & Lifetime Warranty - If you are unsatisfied witha kitchenguru product just return it within 45 days for a FULL refund - noquestions asked! If at any time your kitchenguru product somehow gets damagedjust return it to us and we will replace it! Why wait? Press ADD TO CART and get these awesome trays now!